A JUNIOR doctor who missed the significance of baby’s racing heartbeat hours before he succumbed to a deadly disease has been told he will not face censure over a series of allegations about his conduct. 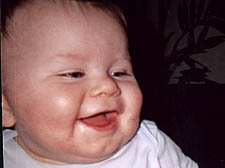 Eight-month old Albie Jago died in December 2005 from meningococcal septicaemia, hours after being discharged by Dr Singh at the University College London Hospital in Bloomsbury. His mother, Sam Johns, who lives in Camden Town, said she was “disgusted” by the panel’s initial findings, issued after four days of evidence at a tribunal hearing in Manchester last month. Dr Singh, who has been working at Keats Practice in Hampstead, is still facing other allegations and the panel has ruled that his care did fall below the required standard when he failed to consider other possible diagnoses other than tonsillitis. An allegation that he did not ask for repeat observations of Albie’s heartbeat and temperature was also upheld. The tribunal will make its final rulings on the case in May and still retains the power to end the 25-year-old’s medical career. Members said it will take into account evidence that UCLH had thrown junior doctors into critical situations with “inadequate training”.